Recently, I needed to share a Google calendar with a group of friends. I wanted each of them to have the ability to view and update the calendar. But I ran into a snag -- one member of the group had a Yahoo mail account, so he could not access the shared calendar at all. I ran into this problem again when trying to share a Google Docs file with a group. Some of them had Yahoo or AOL email addresses, some had work email addresses, and they could not view the document. Or so I thought at the time. As it turns out, there's a semi-secret solution to this problem. To use Google services such as Docs and Calendar, you do need a Google Account, but you do not need to create a Gmail account. To create a Google Account (hereafter simply “Account”) you need a valid email address and mobile phone number. Temporary, throw-away email addresses won’t work, so forget TempMail and similar disposable email services. (See my related article Yes, You Need a Disposable Email Address!) I tried creating a Google Account with some non-Google email addresses that are forwarded to my Gmail address, and that didn't work. A Google Voice virtual phone number won’t work either; it must be a "real" phone number assigned to your phone’s SIM card by your mobile service carrier. With these conditions satisfied, it’s easy to create a Google Account. Start at the Google Account Signup page. Make sure the words “Create Your Google Account” appear prominently; some people go to the Google Account Sign-In page by mistake. Beginning in the right place helps to ensure you end up in the right place. Fill in the routine info: name, email address, new password, phone number, birthday, etc. The email address you provide will receive a confirmation message whose instructions you must follow to finish creating a new Account. (Note that the password requested here is for your new Google account. You should not use the password for your existing email account.) And for extra security, set up two-factor authentication using any of the methods that Google makes available. Once the Account is created, you will have access to Google Docs, the free office productivity suite. It includes Docs (word processor), Sheets (spreadsheet) and Slides (presentation slideshow creator). These apps can create documents compatible with Microsoft Office apps. Also, they support other standards like the OpenDocument format used by Open Office and LibreOffice, two popular office productivity suites that are open-source and free for non-commercial use. Using a non-Gmail email address helps to integrate Google Docs, Calendar and other Google apps with your existing workflow. You don’t have to log in to both Gmail and your work email address; just use the latter for everything. You can, if you wish, create more Accounts using email addresses that you stay logged into at home or for special projects. You can be logged into several Accounts at the same time, staying updated on home, work, and other email without switching accounts. Docs, Sheets, Slides and Calendar are just a few of the free services that comes with an Account. You also get 17 GB of free cloud storage space on Google Drive, plus unlimited space for photos if you let Google Photos resize your photos. There’s YouTube, which can keep a million monkeys entertained for a million years. (You need a Google Account to upload content to YouTube but not to stream it to your browser.) Google Wallet is a growing digital payment system. Google Voice and Alerts also require an Account. The list of Google services gets pretty long on Wikipedia. Bottom line: you don’t have to use Gmail to enjoy the many benefits of a Google Account. Use your existing email address to create your Account, and avoid the hassle of a seperate email address you don't really need. Most recent comments on "Use Google Apps Without a Gmail Address?" But, for us ignorami, could you explain how we get INTO these Google Docs et all. I can visit Youtube, and have a gmail addy, but the rest are invisible. Is it because I do not live in the USA? 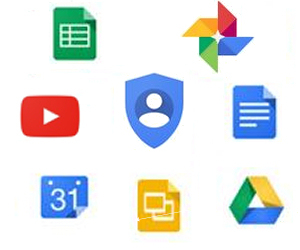 Pete, on any Google page (not YouTube), click on the Google apps icon in the upper right that looks like a grid of 9 little squares, and then click More. You should see Docs among the choices. William! Thanks! I just had Never scrolled down far enough before. Gee Google, can you make it easy for us old geezers? The icon for choosing which Google feature you want to use is in the UPPER right corner, no scrolling down is needed to find it. I never changed my e-mail address to gmail, and use translate and maps in addition to search all the time (notice that if using translate, for example, you click on search to get back to that feature). The problem I have now is accessing Drop Box, after using my google account to log in. I cannot get past a new form of captcha, which has me identifying all the photos with cars, or fireplugs, or traffic signals. It seems like an eye test that I fail, as it just keeps giving me another set of tiny screens to click on the ones with the desired object, with no real information on what I have not done correctly to get out of the infinite loop. Was it just a tiny piece of the object in one image that I missed? I did enlarge the screen, but that did not help. Will I ever get to see what is in that Drop Box? Sarah L.: I have the same problem with the Google captcha forms. The images are so dark it's often hard to tell what's in them. So I use the audio option. Near the bottom of the form is an icon for a microphone or some such (I don't recall just what now). If you click that, it will pop up a place where you click to hear a message. It's somewhat garbled, but it's usually clear enough to hear one or more of the words it says. Type those words in the answer box. That's the best way I've found to avoid that endless loop of almost never getting past the visual process. Why does google have to make the process so difficult? Surely, google hndias already figured out my shoe size and the TP brand we use at home! I am sure that your 'group' contacts (w/o gMail addresses) are fully transcribed in your contacts.google along w/their shoe size... and TP brand! Maybe google thinks 6-degrees of Kevin Bacon is still 'semi-secret'. I am confused???? You say you don't have to sign up for a gmail account, yet in the username field it clearly says @gmail.com. so how is this not signing up for gmail????? EDITOR'S NOTE: Be sure to use the link in the article, and don't click on "Create a Gmail account instead."